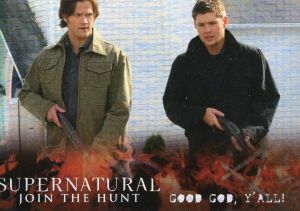 2016 Cryptozoic Supernatural Seasons 4-6 trading cards carry on from where the card maker's last set for the show left off. The base set uses 72 cards to recap the 66 episodes that make up fourth, fifth and sixth seasons. 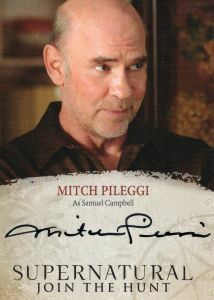 As far as chase sets go, Autographs and Wardrobe cards are likely to garner the most attention. 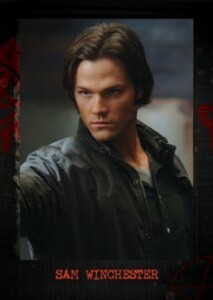 Wardrobe cards include swatches of costumes worn by Sam, Dean, Castiel and more. 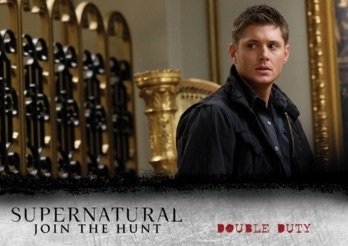 Besides single-swatch versions, Dual Wardrobe cards are also randomly inserted. 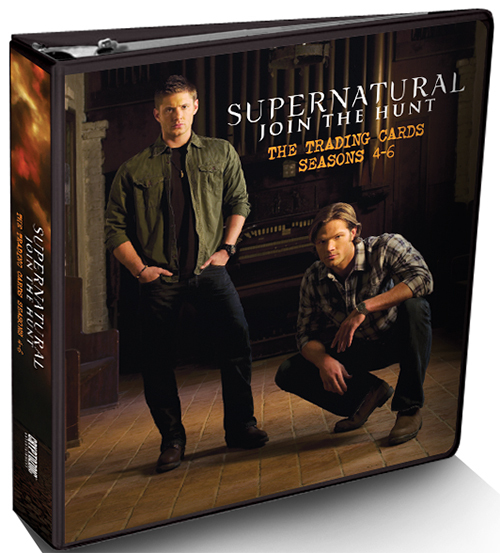 2016 Cryptozoic Supernatural Seasons 4-6 has three additional insert sets: Behind the Scenes, Character Bios and Notable Locations. Sold separately, a custom one-inch binder comes with a random autograph card. 32 The First Annual Supernatural Convention! Good: One autograph & one wardrobe relic per box, loaded with cool foil inserts, and some serial numbered parallels to boot! Bad: The card stock is a bit thin and the base card design could have been more artistic/creative. Considering the low price point per box, neither one of these added features should be expected, but would have been an added bonus. The autograph checklist is missing some key names. 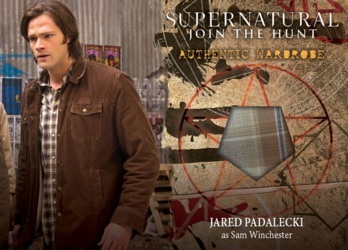 The Bottom Line: Cryptozoic Supernatural 4-6 is an action-packed box break with plenty of noteworthy characters and scenes and the foil/rainbow-foil technology rivals that of major trading card manufacturers. 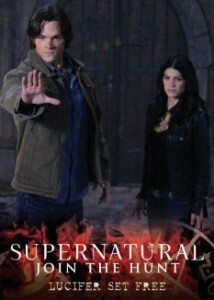 For fans looking to get closer to their favorite characters and moments of the series, or those looking to experience Supernatural on a more intimate level, this is an excellent place to start. The Character Bios insert was probably our favorite design in the box because of the slick black and red border and the foil parallel card we pulled from the same insert set was arguably the best-looking card in the box outside of the main hits. The Notable Locations insert was also a standout for us from a design perspective. Borderless cards are tougher to pull off and the set is loaded with those. Border versus non-border (i.e. full-bleed) cards can be somewhat of a preference, and at times, especially with movie scenes, leaving a border off allows more space to capture the whole scene so it could still be a good fit for many collectors. I personally would have liked to have seen more cards with a border because aesthetically it gives more of an artistic feel to the card. If it wasn't for the aforementioned inserts and strong foil cards, we would have been a little disappointed with the lack of creativity and thin card stock making up the rest of the box. 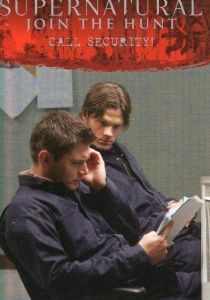 Given that autographs of the two main characters (Dean & Sam Winchester) are absent from the checklist, the rating does take a hit. 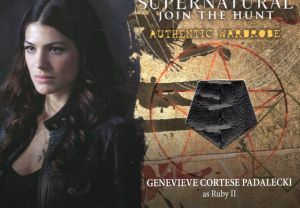 However, Genevieve Cortese Padalecki as Ruby II, and Mark Sheppard as Crowley ARE on the autograph checklist, so there is still plenty of ink worth chasing. 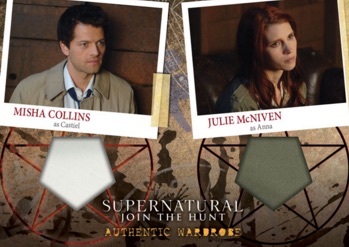 Other notables names, like Misha Collins (Castiel) and the Winchester brothers, show up on some GREAT actor-worn relic cards in the Wardrobe and Dual Wardrobe inserts. With a box price of around $70 to $80, this is one of the better box values that we have come across given the two guaranteed hits. We were only due one autograph but received two desirable characters' on-card signatures, and our costume relic was a very nice swatch of what looks like leather and stitching. Also added in were two foil serial numbered cards (#/50) that look really impressive, plus seven other foil/rainbow foil parallel cards! Even if we had not received the "bonus" autograph, the box would have still contained above-average value. It's nice to see Cryptozoic stepping up their game with trading card manufacturing. Their holo-foil technology is some of the best we have seen and rivals their longest-running competitors. 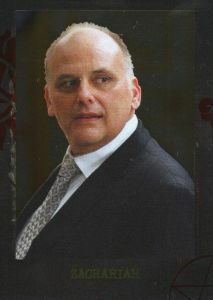 Should Cryptozoic decide to make a foray into sports cards, other manufacturers would surely be scrambling. 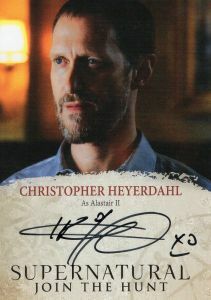 Overall, the strong parallel cards, additional autograph, and great-looking relics made breaking a box of Cryptozoic's Supernatural Season 4-6 a blast. And there is a chromium version of the Character cards as well.